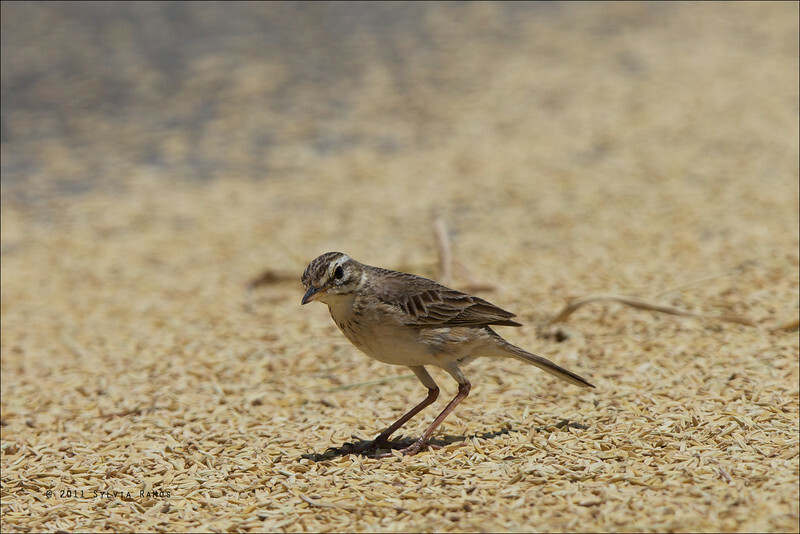 This is called Richard's Pipit Anthus novaeseelandiae in the Kennedy guide. We first saw this bird in UP, during our first guided bird walk with the Wild Bird Club of the Philippines. This bird is sometimes seen strutting around on empty roads. It has a very upright position and a wagging tail. It used to be called Richard's Pipit but is now called Oriental Pipit. There is only on race of this bird in the Philippines but it does get around. We have seen this bird in Ayala Alabang, Los Banos, Paranaque, Lake Caliraya, Villa Escudero in Quezon, Cavite, Mt. Kitanglad in Mindanao, and in Coron Palawan. This bird can usually be found in a grass field or road.